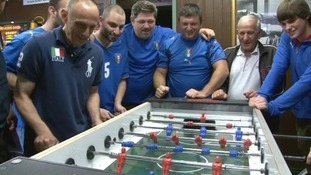 The Italian community in Bedford has been celebrating their team's triumph over Germany in the semi-finals of Euro 2012 last night. The town has turned red, white and green; it seems there are Italian flags everywhere you go. Around a fifth of the town's population hails from an Italian family. Many of them watched the game at Club Italia last night. "The crowds have been fantastic - young, middle aged, old people. It's been brilliant." Two clinical goals from 'Super Mario' Balotelli secured victory for the Italians. Even a last minute penalty from Germany couldn't stop the party back in Bedford. One regular at Club Italia told us: "All the joy, all the emotion and everything came out. You know? And it's just fantastic to see." Hundreds of Italians will be watching the game at Club Italia this Sunday, as Italy take on Spain in the Euro 2012 final. Many are hoping history will repeat itself. Italy won the World Cup six years ago; fans poured out onto the streets of Bedford to celebrate with each other. Business is already booming at A1 Foods, an Italian food specialist based in Bedford. Many Italians have been stocking up on food and drink ahead of this weekend's big game. Alberto and Gianni Rocco, who run the warehouse on the outskirts of the town, told us: "We've had queues coming out of here, it's been very good." Gianni added: "There's definitely people stocking up their larders for the football."